More than 3,000 Isagenix Associates packed into the Brisbane Convention and Exhibition Centre for Celebration 2017 today. The room was buzzing with excitement during the launch of two incredible new products into the ANZ market – the highly anticipated Whey Thins™ in Cheddar flavour and IsaLean® Bar Dairy Free Chocolate Berry Bliss! The new 90-Day Action Plan was launched on stage and our first Spirit of Isagenix Award winner, Rob Hunt, was honoured on stage for his dedication to embodying the Isagenix® culture. If you’re heading to the Crystal Reception or START Party this evening, we hope you have an amazing time and enjoy the opportunity to celebrate your success. In case you missed it, here’s a quick recap of today’s announcements that you can share on social media with your family, friends and team members. 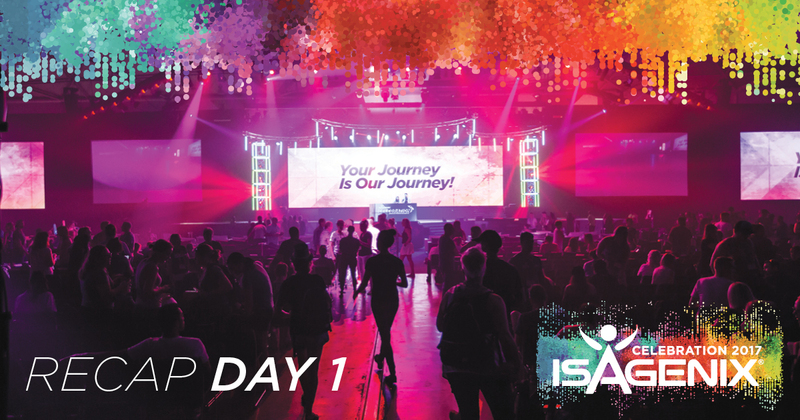 Be sure to stay tuned to ANZ.IsaFYI for more excitement on Day 2 that will keep the vibe of Celebration going strong all weekend and beyond. Opt in now to the NEW 90-Day Action Plan!